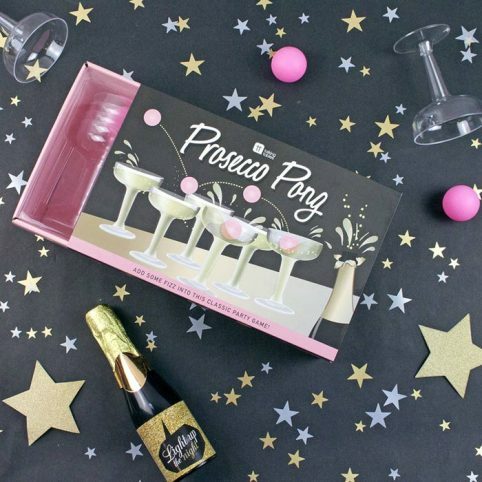 Now that Christmas is around the corner, Prosecco Pong is the perfect drinking game for a special evening with friends or family. The rules are easy : Two teams stand opposite a long table and line up the prosecco glasses filled with your favourite fizzy drink. Each player takes it in turns to throw a ping pong ball with the aim of getting it in your opponent’s cup. If the ball lands in the cup, your opponent has to drink the prosecco. This game is finished until one team has lost all of their glasses. The winner is the one that has glasses left. The drinking game from Talking Tables includes everything you need to get the party started. Twelve plastic prosecco glasses and three ping pong balls. The offer is limited so hurry up!